50030 no 1 end cab December 2009 The cab at No 1 end is shown on the day of the 2009 AGM, 13th December, with the restored drivers dash panels temporarily refitted for display purposes to give an idea of progress to date. 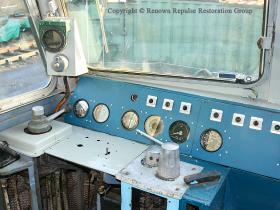 The cab at No 1 end is shown on the day of the 2009 AGM, 13th December, with the restored drivers dash panels temporarily refitted for display purposes to give an idea of progress to date. 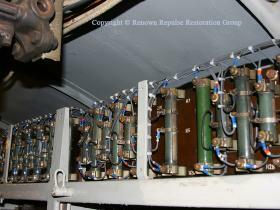 Resistors on top of 50030 electrical cubicle reinstated. This view shows the resistor banks on the top of the electrical cubicle, of note is the fact that at the time we bought 50030, all of this equipment was missing. 29th November 2009. This view shows the resistor banks on the top of the electrical cubicle, of note is the fact that at the time we bought 50030, all of this equipment was missing. 29th November 2009. Refurbished cylinder heads fitted to ex-50008 power unit By the 18th October eight of the overhauled cylinder heads had been refitted to the ex 50008 power unit, five of which are seen in this view. 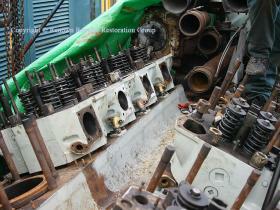 By the 18th October eight of the overhauled cylinder heads had been refitted to the ex 50008 power unit, five of which are seen in this view. ETH and aux gen set for 50030, overhaul nearly complete in April 2009 2009 also saw the completion of the overhaul of the ETH and Auxiliary Generators for 50030, the work having been undertaken by Bowers Electrical of Heanor. These generators are now stored in a secure, dry, heated location until we are ready to install them. 2009 also saw the completion of the overhaul of the ETH and Auxiliary Generators for 50030, the work having been undertaken by Bowers Electrical of Heanor. 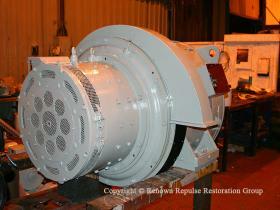 These generators are now stored in a secure, dry, heated location until we are ready to install them.